These walls were used in a couple of Australian “lunatic insane asylums” so as to appear less prison like from the outside. In reality, the walls were sometimes as high as nine feet tall on the inside. As a concept, in elfgame fantasyland, the ha-ha wall is beautifully alluring to me. I hadn’t heard about it until recently when someone linked to a Wikipedia article on the subject on the Dwarf Fortress subreddit. Some time in history, people thought that it was so important their gardens be unmolested by grazing animals while retaining a decent floral vista. Okay. Mechanically the wall works as such; a level of earth is retained by a two to nine foot tall wall of stone or some such. At the base of the wall is a ditch which is the culmination of a gentle decline of top soil. If approaching the wall from the inside, the horizon would appear to be at eye level; you would not see the wall. As you slowly descended into the ditch the wall would be more looming and at which point you would encounter the base of the wall and feel quite the fool. Ha-Ha. Ha-Ha wall- moniker- comes from the jocular nature of encountering such a thing. Imagine now a great and large city inhabited by your world’s most peaceful and near-boring peoples. Immediately languid halfling fatsos come to mind, dilatorily prancing down their tiny and cobbled streets with nothing to do by jaw on about the coming and goings of the world they know nothing about. They keep a small wall around their city as to keep out the claustrophobic fear that the rest of life is quite literally larger than they. The city wall is a modest nine or so feet high, the second stories of some of the halfling cottages (the entire city is likely quaint and wattled and dobbed, even the jail has planter boxes outside the windows) have views unmarred by the city wall. 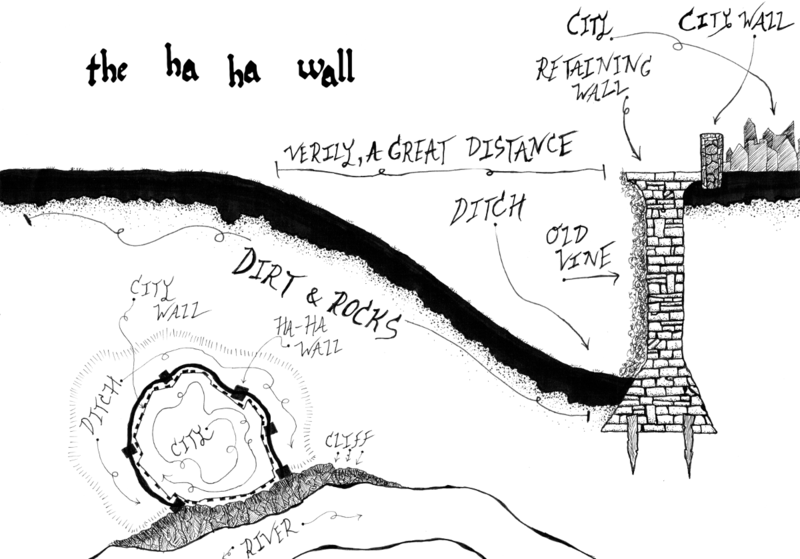 The true defense, however, is that the city sits atop a ha-ha wall some sixty to one hundred feet high. Nary a halfling child goes to sleep at night worrying about invaders or beasts at the gates. A militarized city might even have layers of corridors built efficiently through the retaining wall to provide defensive maneuvers incase of invaders or beasts. Murder holes, arrow slits, and latrine chutes, etc. Anyways, it is a cool concept I personally will be visiting in the next city map.